Fig. 2. 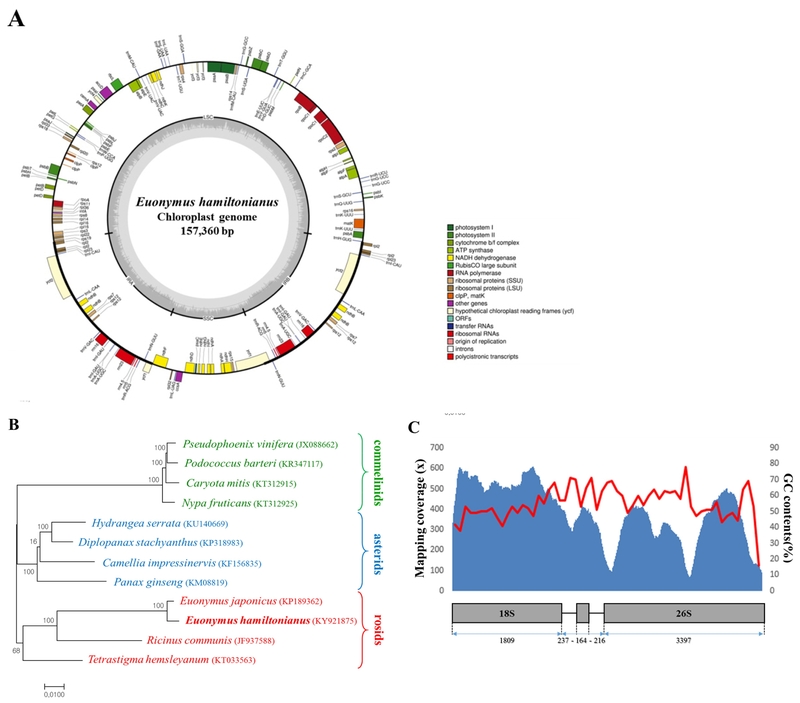 Analysis of complete chloroplast genome and 45S nrDNA units of E. hamiltonianus. (A) Chloroplast genome map of E. hamiltonianus. The complete chloroplast genome sequence was annotated by the DOGMA program (). The map was generated using OGDRAW (). Genes in inner-circle and outer-circle were transcribed clockwise and anti-clockwise, respectively. The features of GC contents are displayed in the inner ring with internal blocks of chloroplast genome, such as long single copy section (LSC), inverted repeat B (IRB), short single copy section (SSC), and inverted repeat A (IRA). (B) Phylogenetic analysis of chloroplast genome sequence of E. hamiltonianus and eleven different species. The green, blue, and red letters indicate the cohorts of Commelinids, Asterids, and Rosids, respectively. The tree was generated by maximum likelihood using MEGA 7 (). (C) Schematic diagram of a complete 45S nrDNA unit of E. hamiltonianus. The WGS reads of EH-v were mapped again to the assembled EH-v 45S nrDNA unit. GC content per 100-bp unit length is indicated by the red line.